Five people were reported dead due to adverse weather conditions with the Meteorology Department predicting landslides and floods if the heavy rains persist in the country in the next few days. An advisory for heavy rains, strong winds, lightning and rough seas was issued by the Natural Hazards Early Warning Center yesterday, as heavy monsoon conditions set in over the island. According to warnings, heavy rain falls of about 150 mm can be expected at some places in the Sabaragamuwa, Western, Uva, Central Provinces, Galle and Matara districts. There may also be temporary localised strong winds during thundershowers. The Disaster Management Center and the Meteorology Department requests the public to take adequate precautions to minimise damages caused by lightening activity. The National Building Research Organisation (NBRO) issued a landslide warning for seven districts for the next 24 hours, including Kalutara, Kegalle, Ratnapura, Badulla, Nuwara Eliya, Galle and Kurunegala. The Agalawatta, Bulathsinhala, Palindanuwara, Walallawita, Ingiriya divisional secretariats in the Kalutara district, Dehiovita, Deraniyagala, Yatiyantota, Aranayake, Rambukkana, Kegalle, Bulathkohupitiya, Ruwanwella and the Warakapola Divisional Secretariats in the the Kegalle district, Ratnapura, Eheliyagoda, Kuruwita and Elapatha in the Ratnapura district, Ridigama, Mawathagama, Ibbagamuwa, Mallawapitiya, in the Kurunegala district, Ambagamuwa in the Nuwara Eliya district, Haldummulla in the Badulla district, Elpitiya, Galle, Kadawath Sathara in the Galle district, Sithawaka in the Colombo district and the Gampaha area are included in the landslide warning issued by the NBRO. DMC Deputy Director Pradeep Kodippili and the Army Spokesman Brigadier Sumith Atapattu said that a special military team is kept stand by for any emergency situation caused by the adverse weather. The Disaster Management Center also released a series of safety instructions and requested the public to use emergency line 117 to inform and seek assistance at any emergency situation. The DMC will be conductng programs on emergency preparedness at 12 districts in the next two weeks as well. Meanwhile, the Road Development Authority (RDA) requested the motorists to maintain an average speed of 60 kmph. The Deputy Director (Operations) Southern Expressway R.D.A. Kahatapitiya said to switch on headlights due to heavy rains when using expressways. The RDA also urged motorists to take necessary precautions to avoid accidents from slippery road conditions as well. “The possibility for sudden roughness, associated with sudden increase of wind speed (up to 70 -80 kmph) in the sea areas in the above is high.The coastal areas extending from Puttalam to Kankasanturai via Mannar and from Matara to Potuvil via Hambantota can be rough at times as the wind speed can increase up to 60 kmph at times. Fishermen are also requested to be vigilant in this regard,” it also said. “Adverse weather conditions had claimed three lives and caused disruptions to electricity and transportation yesterday. Of the three, two were killed due to lightning where as the other was killed by a falling tree branch,” DMC Deputy Director Kodippili said. “The three killed by lightning were residents of Welikanda, Polonnaruwa and Horana. Two were struck by lightning while working in a paddy field,” Police said. The electricity supply for Kegalle, Galle, Agalawatta and Mathugama areas were disrupted yesterday due to heavy rains as well. Maximum rainfall for the last twenty four hours of 71.2 mm was reported from Lakshapana area. According to the situation report issued by the Disaster Management center as at May 20, 2018, 2194 families have been affected by lightening activities, heavy rain and rock falling. The maximum number of 1,960 is reported from Southern Province. 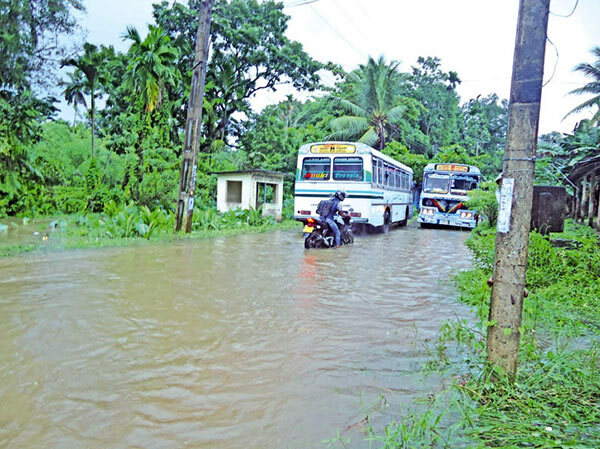 Twenty five families in the Central Province, 117 in the Uva, 24 in Sabaragamuwa, and 53 in the Northern provinces have been affected by adverse weather conditions during the last three weeks.